Bilal (US) with special guests Electric Empire. This marks an agonising twelve year wait for Australian fans who immediately graviatated towards the performer when his Dr Dre and J Dilla assisted debut First Born Second dropped in 2001. Bilal’s artistry is always spoken in the same breath as musicians such as The Roots, Raphael Saadiq, Erykah Badu and sometimes even Prince. 2006’s delayed and ultimately passed-over release Love For Sale was maligned by the kind of bootlegging that made Universal run for the hills but had fans begging for more. His 2010 Grammy nominated Airtight’s Revenge was a dark ride yet still featured all of the immensity of an artist comfortable slipping in to almost any genre. Bilal will bring his signature, soulful beats to the stage performing tracks from his highly anticipated album A Love Surreal which will be released in March on BBE trhough Fuse in Australia. The first single from the album Back To Love is out now and is already leaving its mark on the urban music community; since the video premiered on Essence.com It has well surpassed 3.2million page impressions. A return to the funkier Soul Sista type of output which won him his first fans, A Love Surreal is an all emcompassing summation of Bilal’s career so far, featuring many guests and collaboraters he has worked well with in the past such as Sa Ra Creative Partners and Robert Glasper. On top of his own music, Bilal is well respected in the artist community and has previously collaborated with some of the industry’s biggest names including; Jay-Z, The Game, Robert Glasper, Beyonce and Erykah Badu. 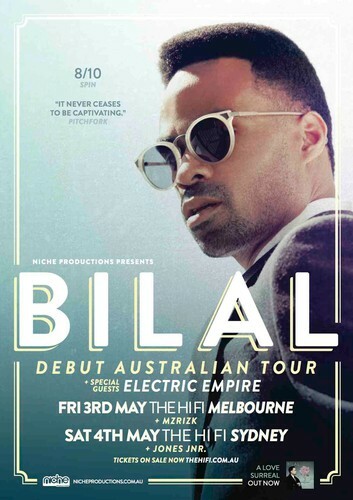 Don’t miss Bilal for the very first time performing live in Australia with his full band this May.